Whoo, boy, was it hard to find something meaningful this week. Guess this color isn't much on my radar. But Becca found something. 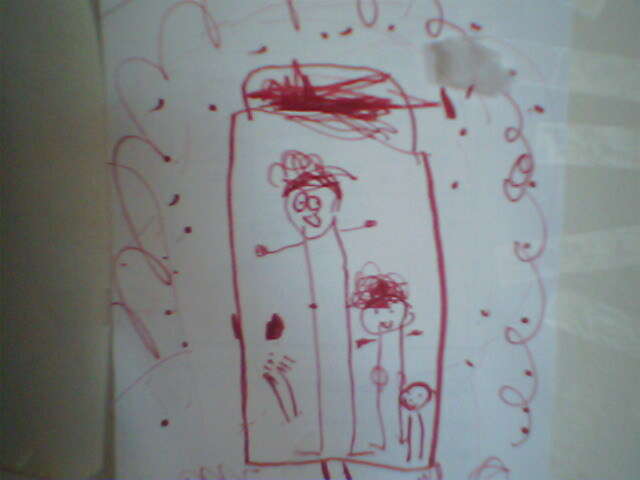 Mommy, me and Jessica, marker on copy paper, 8.5" x 11". 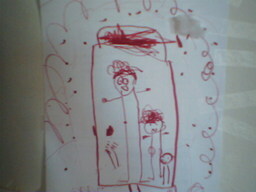 Created during one of Jessie's naps circa February 21, 2007. It *must* have been during Jess' naptime, because that's when Becca pulls out the big guns, the big girl art supplies. One of the things I love most about this photo she took is the stripes in the background. Lots and lots of "sticky tapes," smacked all over my living room wall, right behind the couch. If I get brave, one day I'll take a photo of the whole wall. Luckily, it hasn't been painted yet. My husband and I decided the interior decorating will wait until the kids can wield crayons without covering the walls, sides of furniture and other assorted surfaces, and until my kitty cat is no longer around to claw the heck out of every upholstered object in the middle of the night. Same here...we only have a few walls painted an actual color. :) And...we have old furnature...same reasons.